What is the definition of an unassembled team (or 'not ready' team)? It is a team that does not have enough players. Immediately before the start of a tournament, any team that is not ready will be booted automatically. How to get to a game and find an opponent? 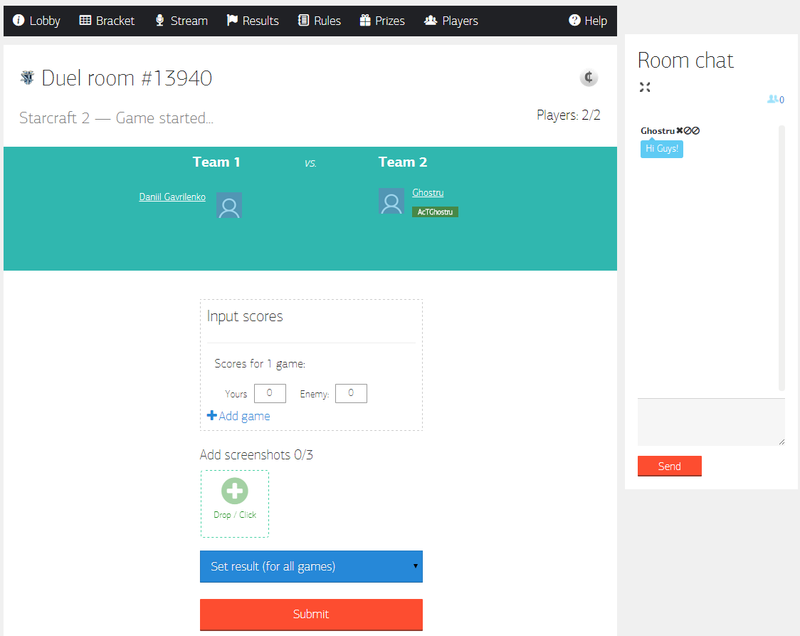 At the start of a tournament, game chat rooms are automatically created. There are three ways to get to a game. One is to click on the big, green, "To The Game" button in a pop-up window that will appear, another is to click on the orange "Go Now" button on the right side of the web page, and the third is to click on the animated alarm clock. Click on one of those buttons and you will be redirected to the game room. You can communicate with your opponent using chat in the game room. Please note that the team captains will post the results of the match after it is finished. How to leave a chat room? Just go to the tournament lobby and click the "Do not participate" button. If you are the team captain, be careful because clicking that button will mean that the whole team will be removed from the tournament. If you are not a team captain and just a normal player, then the team will remain in the tournament. How to put up results? In the game room click "Post Results," then click "Save." When can I see the final bracket? This depends on the tournament organizer. Typically, the final bracket appears just before the start of the tournament. The tournament organizer may also, at any point of time, shuffle the bracket or change the position of players. How to find a judge? The judge has access to a tournament's chat. He can contact you directly or through chat during the tournament itself. Where to find the a stream or a good discussion about a game or tournament? The stream or public chat for a game or tournament can be found by clicking on the "Stream and Chat" link. If you enjoy it, please recommend it to others. 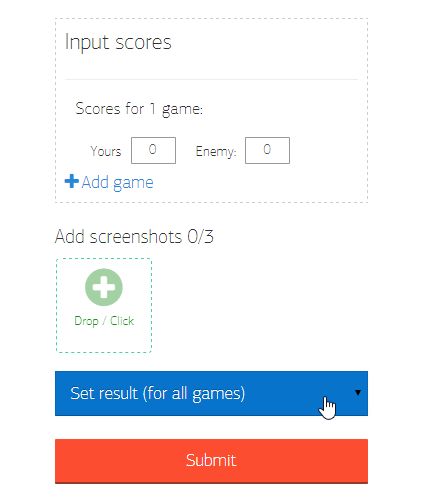 How to negotiate the establishment of a server/lobby in the game? 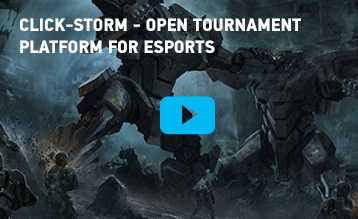 In the game room, chat with your opponent through the click-storm.com site to agree on this. Typically, the time that is on the top side of the bracket is the one that creates this. The most convenient password to use is your room number. Do not worry, as no one can see this number other than the participants and judges. Will the tournament be completed in one day or will it take a few days? It depends on the type of tournament, but tournaments are usually completed in a day or less. I rage a lot. What to do? One thing that differentiates an experienced gamer an inexperienced gamer is the experienced gamer's ability to control his emotions whether he is winning or losing. A top-ranked player may be upset with a judge's decision or loss, but he will control his emotions. This is part of his secret to winning. Controlling one's emotions gives a player an advantage. If you think there is a mistake, calmly notify the judge, tell him your concern and trust him to take the appropriate action. Always remember that the secret to winning is to control your emotions. Here are some recommendations to help you improve self-control that really work: take daily ice-cold showers, do fist push-ups, or do at least five minutes of meditation. Improving your self-control will help you make more balanced decisions!